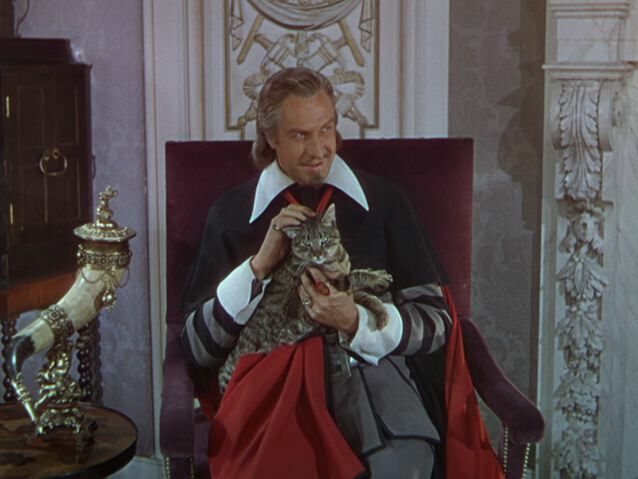 Vincent Price plays Cardinal Richelieu, who in real life was a famous cat-lover. He let his cats sleep on his bed, and at the time of his death in 1642 had 14 of them. To judge by this scene, Price was also a cat lover. He is clearly at ease with having it in his lap while he acts, and the cat itself looks extremely contented. This entry was posted in Cat of the Day, Pussilla, Tabby Cat and tagged The Three Musketeers. Bookmark the permalink.